Shampoo, soap, sugar, epoxy resin, wax, acrylic dispersion: for Clary Stolte every material can be considered to make a monochrome, square painting. Preferably she works with transparent materials that she brings in layers over each other so that the under laying layers stay visible and develop a transparent volume. The experimental impulse is high. Recently Stolte made a sketch of udder ointment on lime paper and spread haemorrhoids ointment on canvas. Usually the paintings of Stolte are modest in size. Sometimes she departs from this to create, for instance, a painting that occupies the entire space. Like a work of hair gel for an exhibition in a gallery. Five hundred litres of hair gel, donated by the manufacturer, she had poured out in a basin of 3 by 3 meters. The contemplator literally couldn’t go around it, and the odour was unbearable. The work evaporated slowly, as hair gel consist for 90% of water and alcohol. This was the intention: the work had to approximately be disappeared when the exposition was at it’s end. Stoltes work is vulnerable and liable to decline. Udder ointment on lime paper is not given a long lifetime, and silver pen on paper becomes yellow after a period of time. Fragility and decline are a component of the work, a painting of Stolte is a living skin. In fact she wants to make a kind of throw away art. Once she considered to make an artwork of lollypops that people could lick away, so that a corner would disappear from the painting. She changed her mind for reasons of hygiene. These paintings are about matter and time, death and live. Because of the process of decline, sometimes slower, sometimes faster, the works of Stolte are never ‘finished’. To emphasize the being of incompleteness she is now working on a series of paintings she calls Unfinished and of which it is explicitly the meaning that they will gather dust. Therefore they cannot be framed. In fact this applies for all of Stolte’s work: ideally the paintings hang ‘naked’ on the wall, and drawings are pierced with needles on the wall. Or they lie on the floor or somewhere on a cabinet, so that you can pick them up, feel the material and the weight. These pieces of art are at their best in the studio. There they have the physical closeness and touch ability the artist had in mind. When the works have left the studio they are often protected against decline by the new owner. Even at an exhibition it is not easy to show them as they are meant. For Stolte the difference between the studio situation and the outside world is a source of frustration. Therefore she prepares for an exhibition that makes the presenting of her work the topic and whereby the presentation substantive of the work. Also in the AMC it is impossible to show Stolte’s work unprotected. The five pieces that were bought from her are shown together in a Perspex box. The measurements vary from 24 x 24 to 35 x 35 centimetres. The first (from left to right) is a point lath made with silver pen on paper. The second is a lath of perforated punch marks, the top half perforated from the top, the lower half from underneath, with halfway a white line. The third is a small white piece of synthetic clay that because of its volume rather looks more like a relief than a painting. The fourth is made lying down, with shampoo on canvas, and the fifth is a shiny, transparent painting with a surface of acrylic dispersion. Stolte was educated at the academy of arts in Utrecht, where she was tutored by Frank van Hemert, an artist whom is on the maximum expression of the paint stroke and of the abstracted form. When she left the academy she started a surge to the reduction of formal elements, until she came to the square, the zero point of the formal, static form. The famous artist Robert Ryman had long before preceded her in this. 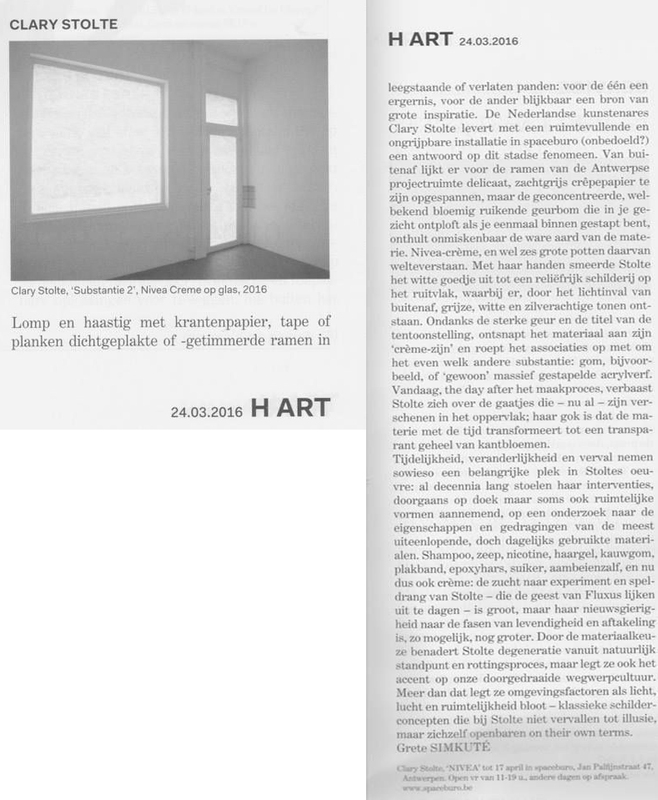 Yet Stolte feels less connected with the white, reductionistic work of Ryman, nor with that of the zero artists, like the white lathes of Jan Schoonhoven. She is more related to artists like Dieter Roth (known of the chocolate-sculptures) and the artists of Fluxus, whom wanted to widen the bridge between art and live, by fore instance using perishable throw away materials. Despite everything Stolte keeps on painting and appoints her work explicitly as painting. The action of the making of a painting is important. She brings shampoo and acrylic dispersion on the canvas with a brush; she pours hair gel, spreads haemorrhoids ointment, and pours sugar water. The action determents the work. Stolte searches for light and transparency. There are many gradations of transparency depending of the material with which she paints and depending of the material of the bearer. The surface reacts to the present light and reflects it. There is glittering, shine. How does a painting relate to the wall, to the space? Where in lies the identity of a painting? When you take away its window frame is it still a painting? What is a painting? Industrial materials such as plastic, acrylic polymer emulsion, epoxy, resin, wax and PVC form the substance of these small monochrome paintings. The materials are mostly transparent and it is possible to apply several layers of a substance. Thus volume develops. Transparency originates when the various see-through layers are applied over each other and the first layers remain visible. This transparency however also embraces a certain density precisely by being worked layer over layer (transparency-density). There are various degrees of translucency, dependent on the number of layers and the carrier used. It can be seen how a PVC carrier shows a different transparency-density than a carrier of, for example, cotton. A third consequence of working layer upon layer is that the work gains depth. The surface reacts vividly to various sorts of illumination, or to the light that is present in the space where the work is shown: shimmer and gloss are a result of reflection. The naked eye can best serve as recorder, because the eye effortlessly registers changes of light on the work to the millimeter -every time the viewer moves. The work is connected to classic art concepts such as light and perspective: how does one create light, how does one render light. Contrast of light and shade. Volume that exists through working layer upon layer, degenerates to perspective, visible because of the depth-working of the transparent substance. The space and the illumination give three dimensionality to the work. The painting in the space leads to questions such as: how does a painting relate to the wall, the room, the architecture? The dialogue between space and painting forms a fascinating process.